For public assistance hotline 2-1-1 San Diego, success means connecting people who need help with the right resources—quickly and compassionately. And that’s not always easy. Agents handle sensitive conversations, such as people seeking food and utility assistance, help with domestic issues, addiction and recovery services, and more. What agents say and how they say it can be the difference between helpful dialogue and an unpleasant one. Sometimes all it takes is a slight misunderstanding or a lapse in connection to end up with dissatisfied callers who don’t get the help they need. 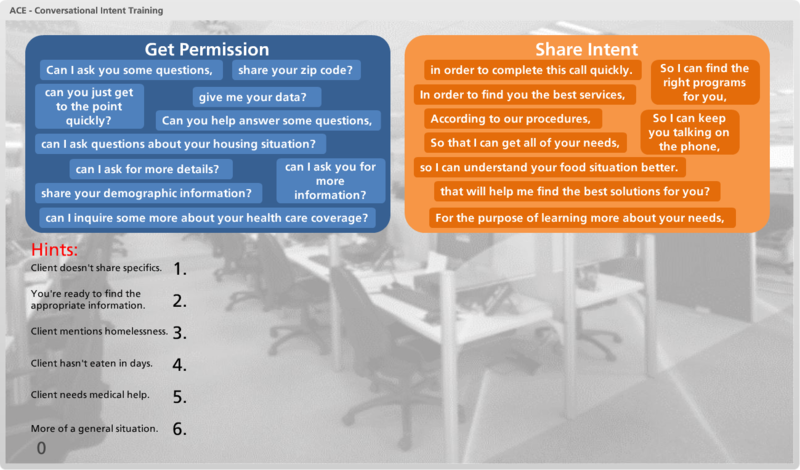 So how do you make sure that agents are always empowered with the information and training they need to connect their callers with resources and make them feel supported? You develop a rock-solid training program. Using Storyline, Gio Jones, learning designer and developer at 2-1-1 San Diego, was able to build three fully interactive, comprehensive training courses ahead of schedule on his own. As a result, the organization boosted customer satisfaction by more than 15% in 6 months. Here’s how he did it. He used classroom training and reading assignments to introduce learners to the breadth of services available and coach them on conversational nuances, such as active listening, word choice, and tone of voice—things he wanted to train in-person. Then, he used online training to let learners apply these concepts in a variety of scenarios until they were comfortable with them—without keeping them away from their desks and off phones. “E-learning was essential because it was a place to recap and practice what our agents learned in the readings and face-to-face trainings,” he notes. Right from the start, Gio wanted to make sure the e-learning grabbed agents’ attention and moved quickly enough to keep them engaged. Each course features a character to guide agents through the material, along with audio clips of realistic dialogue to bring a scenario to life. 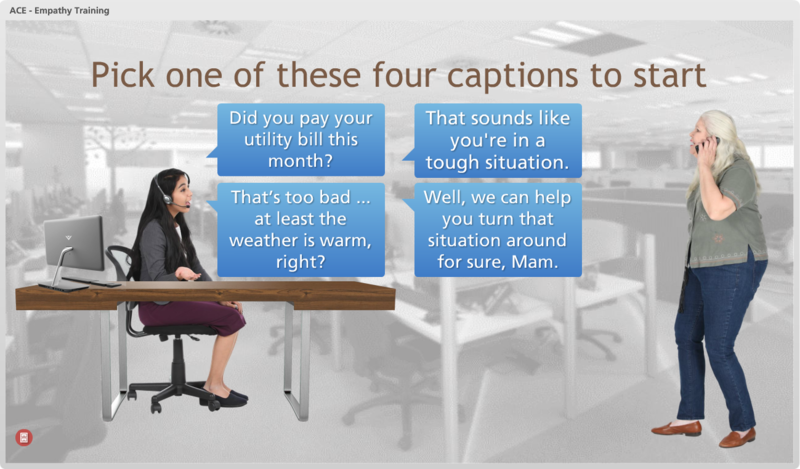 With dialogue recorded in-house, it’s easy for learners to imagine themselves in the scenario. Gio even asked employees to help. “We run a lean operation, so it was really fun to get people involved to voice different parts. They loved being a part of the finished product.” With Storyline, he was able to record narration from within his workflow, making it easy to add a personal touch. Customer agents at 2-1-1 San Diego deal with a lot of emotionally loaded calls. When speaking with a defensive or suspicious caller, the agent’s goal is to engage the customer as an active participant in the process of getting them help. Agents need a lot of practice getting this right—it’s tricky! That’s why, after being introduced to the material through readings and in the classroom, the agents use online training to practice the newly learned skills until they become habit. It was important to Gio that the courses felt as real as possible so that the simulated practice would be immediately applicable. With Storyline, he was able to personalize courses to put agents at the center of the action. 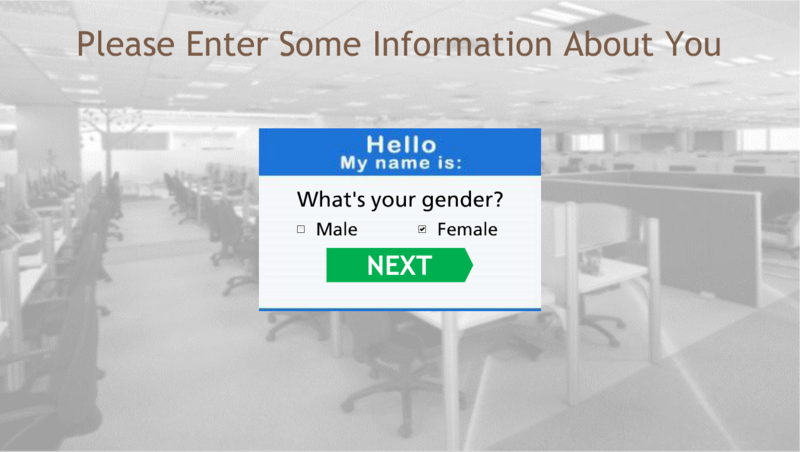 Gio used Storyline’s variables to create a gender-personalized experience for agents. In each lesson, agents are presented with branching scenarios that let them choose the best way to respond to different situations. To move through the modeled conversation, agents must select the best answers based on what they learned in readings and classroom training. If they choose an inappropriate response, they’ll see how a caller might respond and are prompted to consider (with hints) how to navigate the situation differently. This gives learners plenty of opportunities to recover from a misstep. Branching scenarios like this one let agents think through each response before choosing one, modeling what they’re asked to do on the fly in their day-to-day role. Gio also included drag-and-drop exercises to let agents piece together the most effective statements for connecting with callers. In this low-pressure environment, agents practice building trust and improving their ability to quickly match callers with the resources they need. 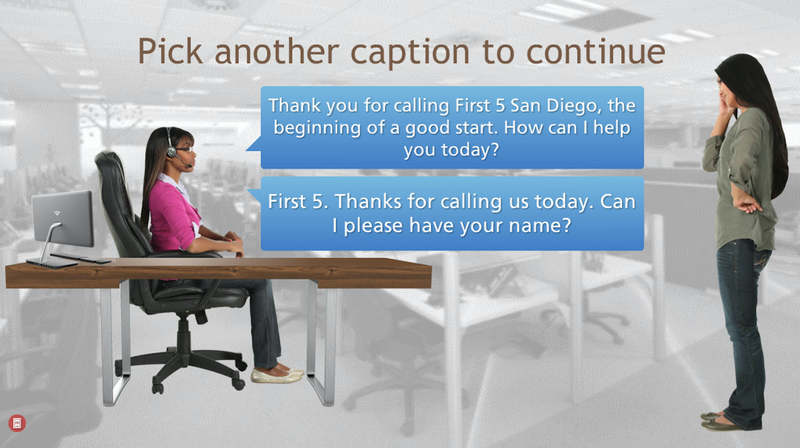 This drag-and-drop exercise helps agents build statements that make callers active participants in the conversation. At the end of their training, agents must pass a multiple-choice quiz covering all the material covered in the reading materials, classroom, and online training. Additionally, an in-house QA group monitors calls to make sure agents are practicing what they’ve learned in the training. In the event that agents are not meeting metrics, Gio created a coaching course that covers additional training scenarios. Gio’s approach to training agents has delivered serious results for 2-1-1 San Diego. A month after launching the first course in his three-course series, callers showed a 5% increase in satisfaction after the first month, with a 2% lift month over month for the next 5 months. That’s a 15% improvement in customer satisfaction in just 6 months! Not only did 2-1-1 San Diego achieve awesome results, it did so in record time. At many companies, the development time for a three-course e-learning program could be a year or more. But with Storyline’s help, Gio completed a single online training course in the three-part curriculum in just 10 weeks, and the other two took even less time. “Once I had the first course down, the other two were a snap,” he smiles. What’s more, with the e-learning he developed using Storyline, Gio was able to train agents while they simultaneously answered calls. Over the 30-day implementation, Gio and his team were able to move all 60 call-center agents through the program in shifts. Today, the program Gio helped establish is a primary tool for onboarding and refresher training. Storyline makes it easy for organizations like 2-1-1 San Diego build the training they need and quickly realize results. See how this award-winning authoring tool can help you achieve extraordinary things at your company.